Hi Guys! 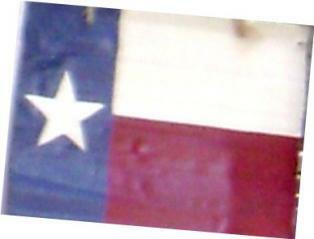 Welcome to Down Home Farms, our little hobby farm in East Texas. 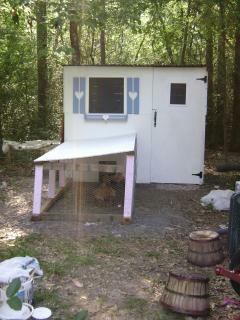 We have 28 Chickens (11 babies), 35 Quail ( 25 Pharaoh, 10Texas A&M), 4 Rabbits, 1 Cat, and 5 Dogs! 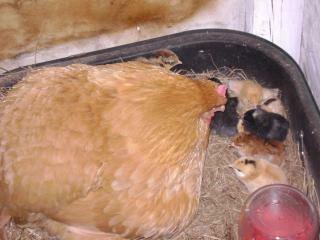 This is the "Hen House" we built in the spring of 2008...along with the first of our Buff Orpington babies. 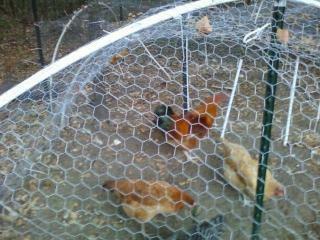 We started out with six hens. Unfortunately a rowdy raccoon or two managed to get 3 of our original six babies, we have since replaced them, it was a very sad day for us, but we know they had happy lives, short though they may have been. We acquired some fertilized eggs of mix breed chickens and grew to have 8 hens and 1 very handsome rooster. We have since added two additional runs from the Hen House, what I'm calling "the chicken condo" addition at the back of the chicken house, and have added additional runs for the Silkie cabin, as well as expanded the chicken yard so that we can let them roam a little each day. We have given all of our mixed breeds to a lady that sooo wanted chickens, but didn't want to start with babies, we're glad we could spread the "chicken addiction" LOL. We now have 12 Buff Orpingtons, 3 Silkie babies we hatched and 5, 3 month old silkies purchased locally, and just added 8 Black Copper Marans chicks (Wade line) from a reputable breeder, and will soon add some blue orpintons to the family. We have also added 35 quail, 25 Pharaoh and 10 Texas A&M, 2 Dutch bunnies and 2 Calafornia bunnies, our dogs are as follows: 2 Maltese, the older ladies of the house, Lilly Mae & Jazzy, 1 Cockapoo, Choxie, she's "the middle child", 1 Yorkie, the only boy in the house, Harley, and the newest addition is Dixie Belle, a cute little lady and a miniature poodle. Itty Bitty is our ever faithful tom cat who keeps all the mice & snakes away. We love them each and every one. 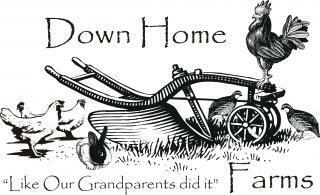 This "Hen House" was the beginning of Down Home Farms. W e focus on giving our animals the best life they can have.